Samsung has improved tremendously its Multi Window multi-tasking feature. To access this feature you must enable it from settings. Then you can open its menu from anywhere in the UI by a left swipe from the right edge of the screen. There you would find all the apps, supported by the Multi Window UI. Multi Window, just like before, allows two apps to share one screen. You drag and drop the apps you want to open and then you can resize them by dragging the dedicated virtual separator. Unlike before, now you can open even more apps by dragging them to the screen - the new app appears in a new floating window that you can move, minimize to an icon or expand to fullscreen. So, you can open all available apps in Multi Window, and they will stack up one over another (although we wouldn't advise you to do that for performance-related reasons. Then just pop up the Multi View bar, tap on the shortcut of the open app and it will be brought back to the front. Oh, and you can open multiple instances of the same app as well. But wait, there is more. If you tap on an app's icon in the Multi Windows UI instead of drag-and-dropping it to the screen, you would get a floating app window instead! This works just like the Sony's Small Apps feature. You can minimize such an app to just a floating icon, go full screen or just close it. You can open as many floating apps as you like, though you can have only a single app instance running. You can configure various content from My Files, Videos, or even email attachments to open straight in new windows under the multi-window feature. Finally, Multi Window supports combinations - you can assign a shortcut that opens any two apps of you choice side-by-side with just one tap. Nice! 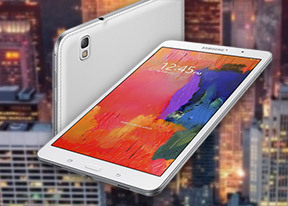 The Galaxy Tab Pro 8.4 tablet features a couple of virtual assistants - Google's Now and Samsung's S Voice. It provides traffic information to your work or home, knows those scores of the sports teams you follow, gives you the weather forecast for your city and can even tell you who Kevin Spacey is. S Voice can be used to dictate text, play music, open an app, change a setting, make a memo (including voice memo), add a reminder, schedule an event, set an alarm or timer, check the weather, do a search on the internet, look for local listings (e.g. nearby restaurants) and even get an answer to a question. S Voice does duplicate parts of Google Now, but being less search focused it tries to do more on the actual tablet and it has some added features. Some of these are available outside of S Voice too, so you can set the Galaxy Tab Pro 8.4 to snooze an alarm, take a photo and what not by voice commands even when S Voice isn't running. The only problem with S Voice is that it's not nearly as fast or as accurate at recognizing your speech input as Google Now.